Which are you feeling...conviction or condemnation? There's a big difference. Conviction is from the Holy Spirit of God correcting us and leading us toward repentance and life. Condemnation is from the devil and leads to despair ending in death. All we need do is check how we are feeling inside to know which we are feeling. If it's conviction we are hearing, we should promptly repent and do our best to conform our lives to God's Word that our lives might be more full of joy and peace. If we are hearing condemnation, we should rebuke what we are hearing and turn a deaf ear to it as it is from the one who wants only to destroy you. 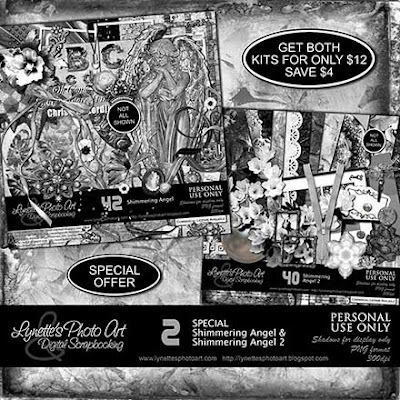 Today I'm giving you a piece from my Shimmering Angel Kits Combo to sample. Complete details are here. Click image to enlarge. This combo is part of my huge sale (much less than this regular price), but you must click the sale preview below this product preview and use that link to buy this combo in order to get the sale price. Love this kit, thank you!